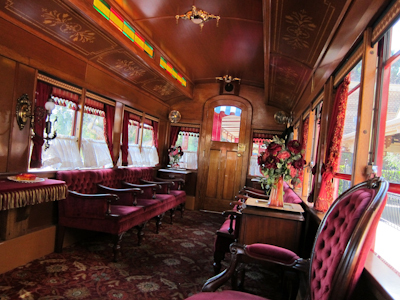 The Lilly Belle is Disneyland’s private train car, named after Walt’s wife Lillian and used to entertain VIPs at Disneyland starting with its first passenger, Japan’s Emperor Hirohito. And I got to ride it. And the best part is that YOU can ride it too! If you’re persistent enough and your timing is good. But more on that in a bit. 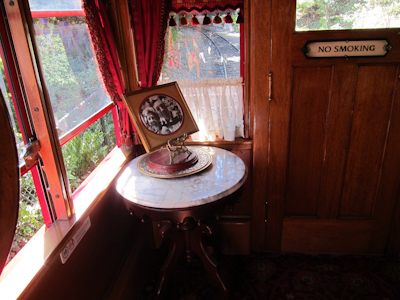 The Lilly Belle was originally a regular train car that had been taken out of service to make way for the cars where all the seats face sideways so you can see the Grand Canyon and Primeval World dioramas. 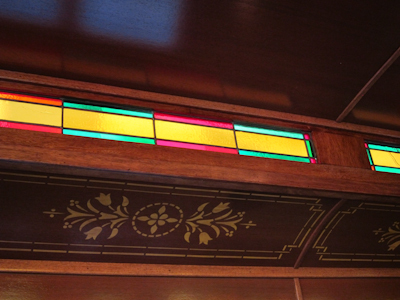 In 1976, just in time for the bicentennial, Disneyland converted the Lilly Belle into a private train compartment for VIP guests. 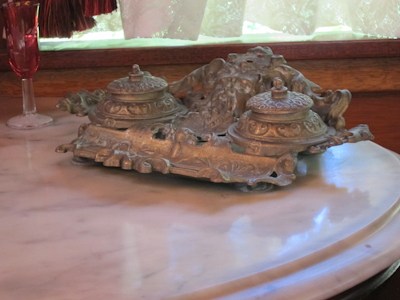 The car was decorated in a Victorian theme to match Walt’s apartment above the firehouse. Looking back at the rear door. 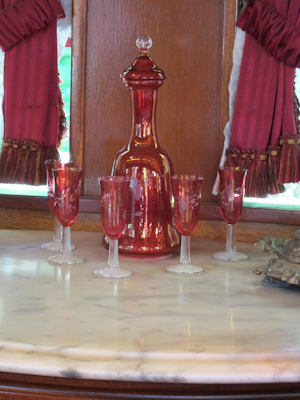 The Lilly Belle is not actually tilted like this picture. And the details throughout the car are just wonderful. There are a few tables including this buffet. There are a couple of small side tables, one of which was set up to be a drink-that-comes-in-small-glasses and writing table. 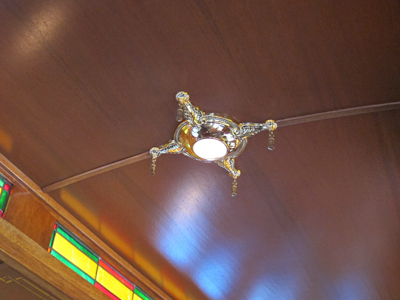 Let’s look a little closer–beautiful glasswork. Kevin and I collect fountain pens and things that fountain pens rest on, particularly Victorian pen stands, so I couldn’t resist a closeup of the pen rest and ink bottles. and a photograph. According to our conductor, this is a reproduction, since someone stole the original. Nice. 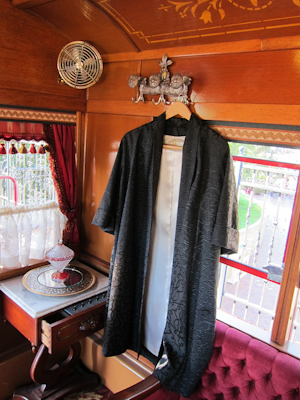 A particular highlight is a kimono near the door, said to be a gift from Emperor Hirohito himself. I’m going to guess that this one is a reproduction, but it’s still very beautiful. Man, I miss the decorations from the Victorian age. She said as if she’d actually lived there. 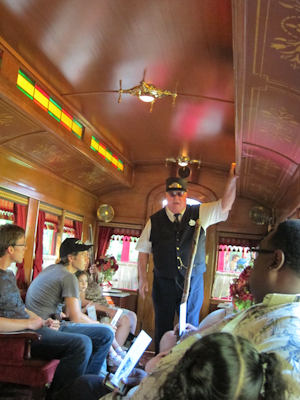 Since people have acted poorly in the Lilly Belle in the past, each group has to be accompanied by a conductor. The up side to that is that you get a whole history lesson while you ride. This was Vern. He was great. You even get a special Lilly Belle ticket with a hole punch shaped like a locomotive. I forgot to take a picture so I’ll post one later. Vern and a corner of my friend and blog reader, Linus V.
On our trip, the Lilly Belle was pulled by the Ward Kimball locomotive, although any of the locomotives can do it. 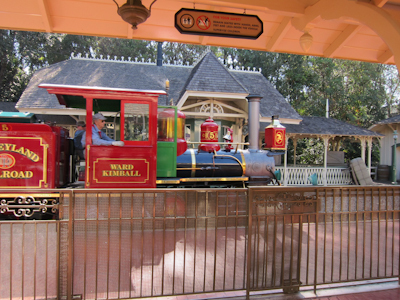 So now, I know your burning question–How do I get on the Lilly Belle??? 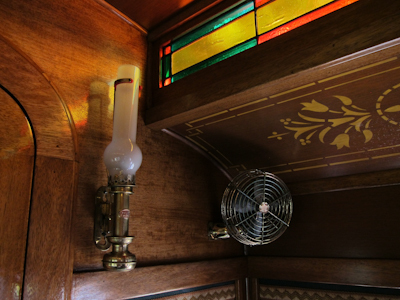 The Lilly Belle requires an extra conductor and one may not be scheduled for the day you’re there, which is another reason why they might turn you away. 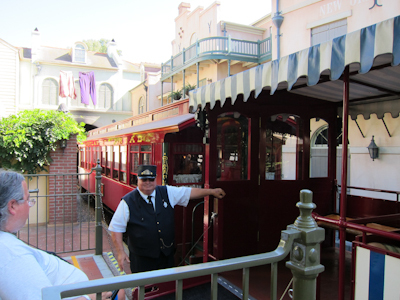 As soon as you get in the park, go up to the Main Street train station and when a train comes by, ask the conductor if the Lilly Belle is in service and if so, can you make a reservation or ride immediately. The Main Street station is where all passengers are expected to board and disembark. A passenger who needs to use the wheelchair ramp boards at the New Orleans station. Be sure to ask at the MAIN STREET station unless you use a wheelchair, if you ask at any other stop they won’t let you on. If you use a wheelchair, ask at City Hall. Now honestly, chances are good you’re going to get a no, so if you want to ride and you’re from out of town, make sure to inquire the first morning of your trip and keep it up until you leave. Don’t wait for your last day to see if you can get a ride. 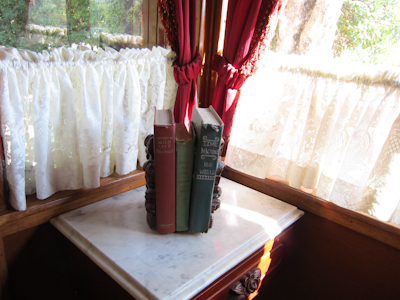 The Lilly Belle is truly one of those hidden, little-known experiences at Disneyland that make your visit that much more magical. And in the search for Disneyland Magic, I’d say that’s a big hit right there. Once again thanks for the information. My son loves this train, and that experience will make it even better. Like riding in a Caboose! Definitely keep trying until you get to ride it! It was really a special experience. 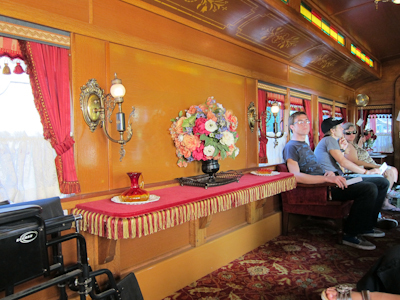 Kevin is huge into trains as well so I’m definitely going to go back with him–this time I was here with my reader Linus who knew how to get on (asking that day, being politely persistent, etc.). If you get to do it, be sure to come back and leave me a comment! There’s no more guest book :(. The conductor said they took it out, though I can’t remember why. It was actually very “no touching!! !” and closely supervised the whole time, and I can see why. What a great experience though! How neat, and it’s something I never knew about before. 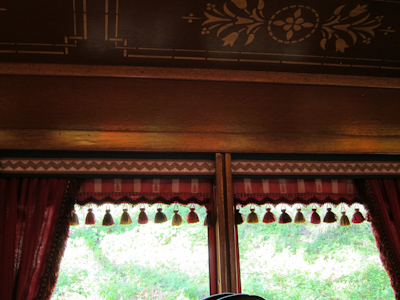 What a gorgeous train car, and what a great opportunity. 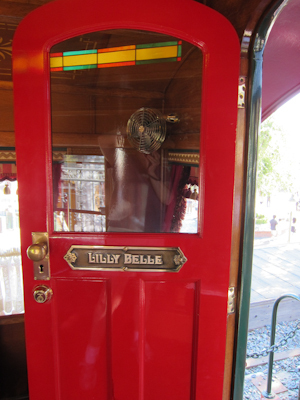 Very, very cool and how awesome you got to go on the Lilly Belle. It was really cool! 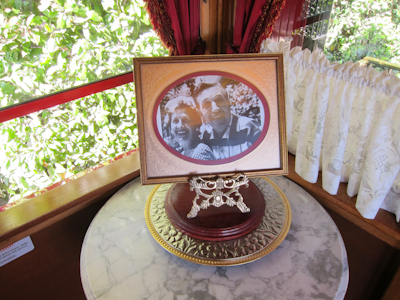 I read someone’s blog where they proposed to their wife on the Lilly Belle. What a special memory!!! wow! this might be my favorite blog entry so far!!! 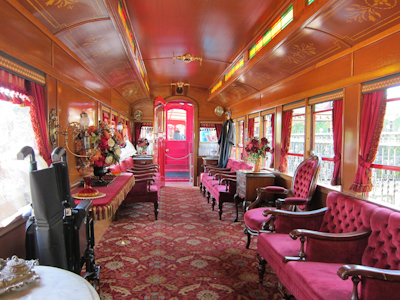 I had no idea that the Lilly Belle existed. I definitely want to see if I can ride it sometime. Cool! That’s MYWTM for you! Bringing together things people haven’t heard of and people-who-carry-no-quarters since 2011! It seems like sometimes there’s a disconnect between City Hall and the conductors. Definitely go up Main St. station and ask. Can’t hurt and you might get on! Boo you went without me!! So happy you got on, though envious. 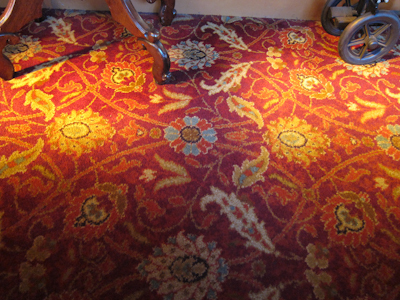 It looks amazing, I have a new quest now… to ride the Lilly Belle. I would’ve waited, but if last Friday taught me anything it’s that you’ve got to take the chance when it comes up! I’m happy to ride it again though ;). Amazing & thank you for sharing this with us. 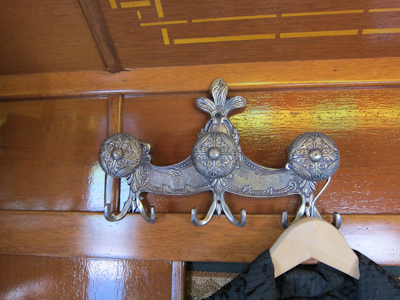 Pingback: Review The Lilly Belle! 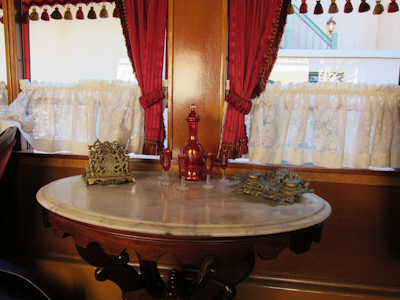 Another way to get on the Lilly Belle is to have two half asleep/half “having a tantrum because they wanted to see Mickey” six -year-olds. Oh and me being an angel :D. Yup, there was no other room on the train and it was 11 pm. The people in the car noticed us and said we it would be ok if we joined them. Apparently it was against something, (don’t expect me to remember, it was4 years ago) but that’s the magic of Disney. P.S. The guy who was giving the “lesson” let us in on the fact that the seats were stuffed with horse hair. And that’s why I stood up, (or tried to) for the rest of the ride.